Recently, “Trina” – one of the students in one of my classes known as Alpha – was doing a wood run and found an ancient Eastern box turtle! This was the first adult box turtle found at our Sky Valley study site since 2014! The students and I collected the vial scientific data on this old female box turtle and in doing so found that she has a unique injury that she has overcome with great dignity – her plastron (bottom shell) has broken free from her carapace (top shell)! How this happened in the deep forests far from humans we have no idea but whatever caused it, it must have been very traumatic but Odyssa*, as we named the ancient old reptile, pulled through the hardship and continued on her life’s odyssey. Box turtles are just amazing creatures. 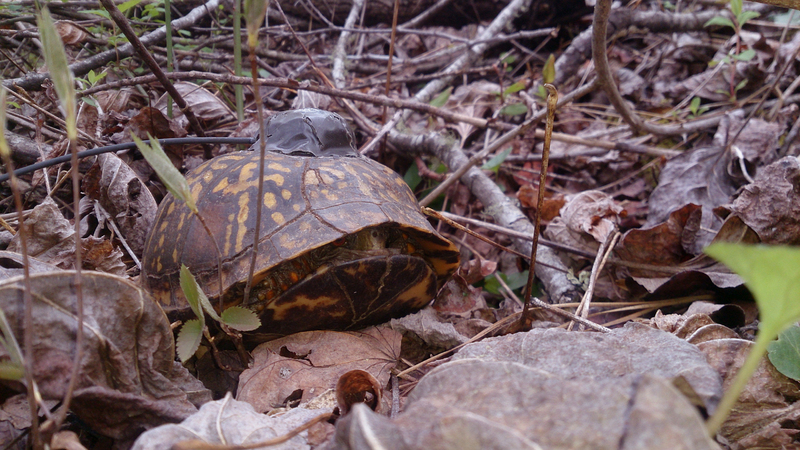 Box turtles are protected by law in many areas. This means no collecting, harming or touching other than helping them across the street. Box turtles do not make good pets. They have very strict food/habitat requirements, may live for a century, and see #1. Box turtles are very beneficial animals to have in your yard/garden. They love to eat the pests that would otherwise eat your garden fruits and veggies such as slugs, snails, caterpillars and so on. Count yourself lucky if you have a box turtle in your yard/garden. Yes, they will occasionally eat a strawberry or tomato but even they need a balanced diet. Box turtles are “home-bodies” and live in very small habitats their entire lives. Research shows that moving them away from their habitats can be detrimental to their health and to their lives. If you find a box turtle crossing a road – it is not lost. It is only crossing the road. All you need to do is gently pick it up – they do not bite – and move it to the side of the road that it was moving toward. Place it a few yards off of the road and it will go on its way. 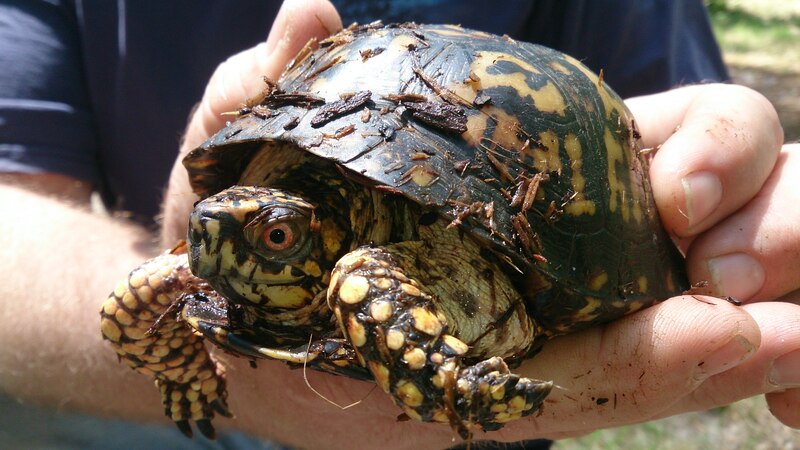 If you find an injured box turtle and it has a cracked and bleeding shell or damaged appendage please place it in a container and take it to the nearest veterinarian. They will have a list of local rehabilitators who will care for the turtle at no charge to you. Most importantly – be sure to write down the EXACT location where you found the turtle and give this information to the veterinarian/rehabilitator. This is so they will be able to take the turtle back to its habitat for release when it is better (see #2) . Respect the wonderful box turtle. 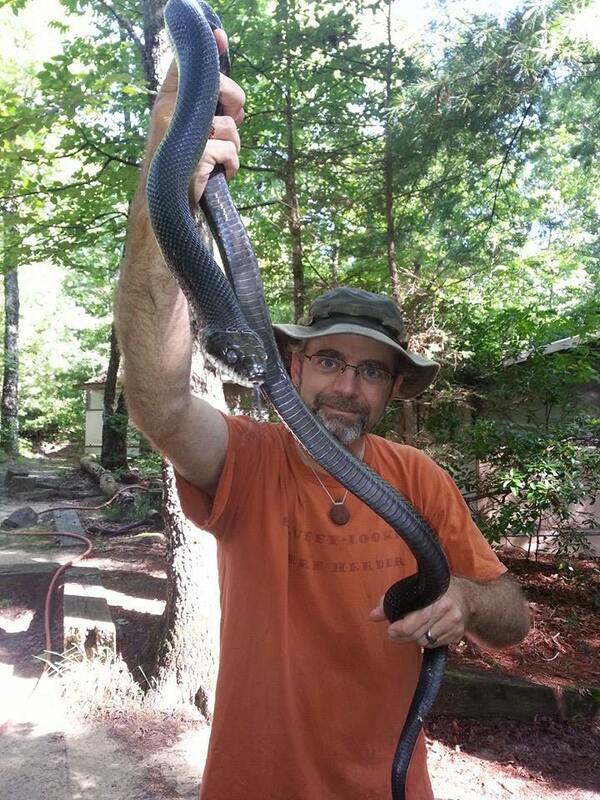 Read my recent story on why I save snakes and turtles and Opossums. ENP is running in the Mad Mountain Mud Run for the 3rd year in a row! That’s right, Earthshine Nature Programs Executive Director Steve O’Neil and Team Earthshine Nature Nerds will be running again this year in the Mad Mountain Mud Run 5K in Hendersonville, NC on Saturday May 30th, 2015! For 2015 the Nature Nerds will be sharing the muddy trail with The Trails Turbo Turtles! The Turbo Turtles consist of several Steve’s students and staff of The Academy at Trails Carolina and Trails Carolina! Captain Steve will be overall captain of both the Nature Nerds and the Turbo Turtles. Our nerdy nature goal is to run representing Earthshine Nature Programs as our 2015 spring fundraiser. To do this we need sponsors that are willing to support Earthshine Nature Programs with a pledge. Your pledge will provide direct and 100% support to our environmental science education and wildlife rehabilitation and conservation programs and projects. Last year and this year the students and I have constructed an obstacle for the Mud Run — take a look at a few photos of this years obstacle that we call the ENP/Trails Turbo Tunnels!! Take a look at the course map for a taste of what we may have in store for us this year! It should be a muddy fun challenge! Those who sponsor ENP with $50 or more will receive your business logo or name and weblink* on the ENP supporters website, in a posting in this blog (to be updated after the race), and on the back of our custom mud run t-shirt that we will proudly wear during the race. Those who sponsor us for $500 or more will receive your business logo or name and weblink* on the ENP supporters website, in a posting in this blog (to be updated after the race), on the back of our custom mud run t-shirt that we will proudly wear during the race, four custom designed ENP Medici Lighted writing Pens from Myron.com, your own custom mud run t-shirt, and one “Honored Supporter” custom award (made by Steve) which includes a certificate of appreciation and small glass vial filled with a small amount of the actual mud from the race course that we will run through on May 30 th! Those who sponsor us for $1000 or more will receive will receive your business logo or name and weblink* on the ENP supporters website, in a posting in this blog (to be updated after the race), on the back of our custom mud run t-shirt that we will proudly wear during the race, six custom designed ENP Medici Lighted writing Pens from Myron.com, your own custom mud run t-shirt, and one “Honored Supporter” custom award (made by Steve) which includes a certificate of appreciation and small glass vial filled with a small amount of the actual mud from the race course that we will run through on May 31st! On top of all that Steve and his animals will come to you and present a private Misunderstand Wildlife animal show with live animals and a didgeridoo concert at your birthday party, school or other gathering! 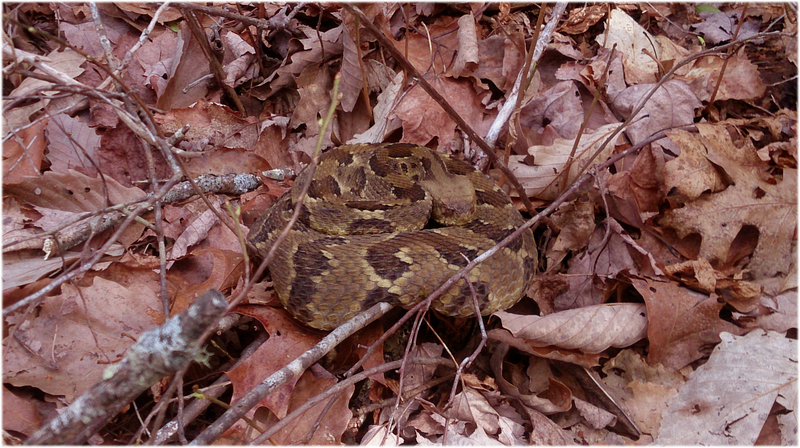 Project B: Snake Tracks – Ratsnake Tracks. 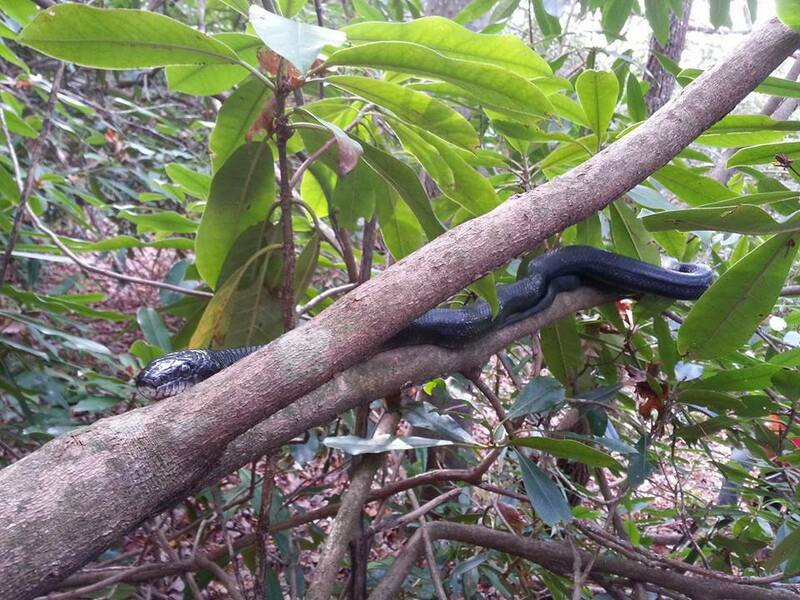 A radio telemetry project tracking two large Black rat snakes at The Academy at Trails Carolina. This will be part of a hands-on citizen and student science class led by Steve for the Academy at Trails Carolina and Trails Wilderness students. Projects A-B are most important wildlife science and conservation projects seeking to learn as much as possible about the natural movements of some of nature’s most misunderstood creatures. Data collected during these projects will directly benefit the greater understanding and conservation of not only box turtles and Rat snakes but all reptiles for many years to come. These projects also directly benefit the continuing hands-on education of middle and high school age youth–the future of all wildlife conservation. Project C: Wildlife rescue and rehabilitation: ongoing support of our wildlife rescue and rehabilitation activities that works primarily with the Eastern box turtle and Opossum. Project D: General program support. Examples include–animal care, habitat construction and project support: this covers all costs that are not directly part of or that cross over between all of the above listed programs. Example: radio telemetry equipment, foods, housing, vitamins, and medications for our resident and rehab animals, rechargeable batteries, camera equipment etc. After last year’s Mud Run we were all smiles–it was great fun! Earthshine Nature Programs is not responsible for or affiliated with ads that may appear below this line. First Box Turtle Rehab for 2015! About a month ago I was contacted by a local man who had found a wild Eastern box turtle in his driveway. This turtle was very sick, its eyes were swollen shut, it had a nasty nasal discharge and it was very weak and thin–all the symptoms of the classic upper respiratory infection that box turtles are often afflicted with shortly after coming out of hibernation. 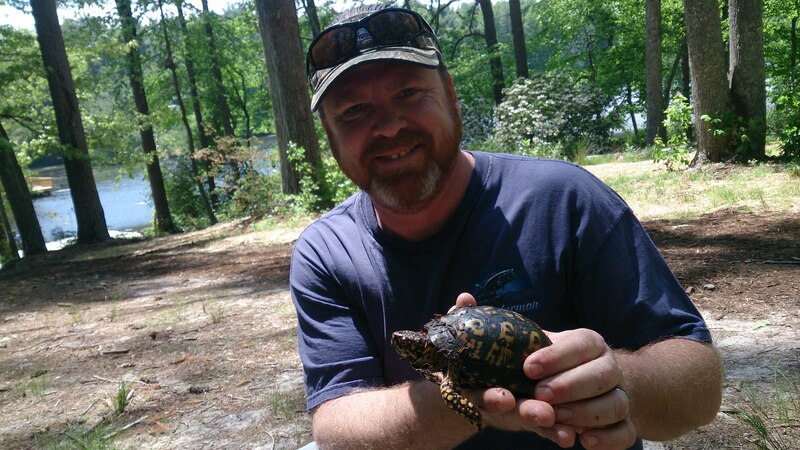 I directed the man to take the turtle to my wildlife veterinarian, Dr. Coleman of Haywood Animal Hospital in Hendersonville, NC. He did so, Dr. Coleman expertly treated it, and I later picked it us for convalescence at the nature and science center. When I picked up the turtle I noted that it was light in weight and looked miserable. If you have ever had a bad sinus infection you will understand. I isolated the turtle in a warm enclosure separate from all other education animals because there is always the chance that this turtle had a much more serious viral or bacterial infection that we would not want to inadvertently transmit to the other animals. The students and I cared for the turtle for about a month, keeping it hydrated, giving it antibiotic injections, and finally feeding it loads of earthworms, vitamin enhanced canned cat food and fruit which it readily accepted. On may 15th the turtle was fully recovered and went home with it’s rescuer to be released in its native habitat and as you can see in the photos they both look very happy and healthy. Thank you sir for caring about wildlife and going above and beyond to help this turtle recover and get back to playing an active role in a healthy ecosystem. 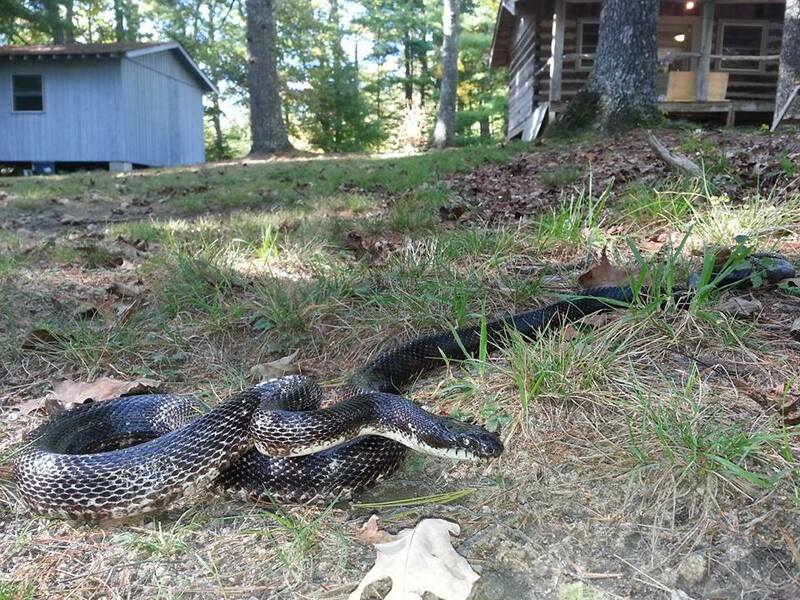 Another wonderful wildlife rehabilitation success story! If you find a sick or injured turtle, snake or Opossum and you are local to the Western North Carolina area, please do contact me and I will work with you to help the injured animal recover and get back into its native habitat as fast as possible. If you live far from Western NC and need help with an injured animal, please feel free to contact me for information, which I will be more than happy to provide, but for immediate care you will need to contact your local veterinarians as they often have lists of wildlife rehabilitation facilities that will be willing to help. Trails Academy and Trails Carolina. 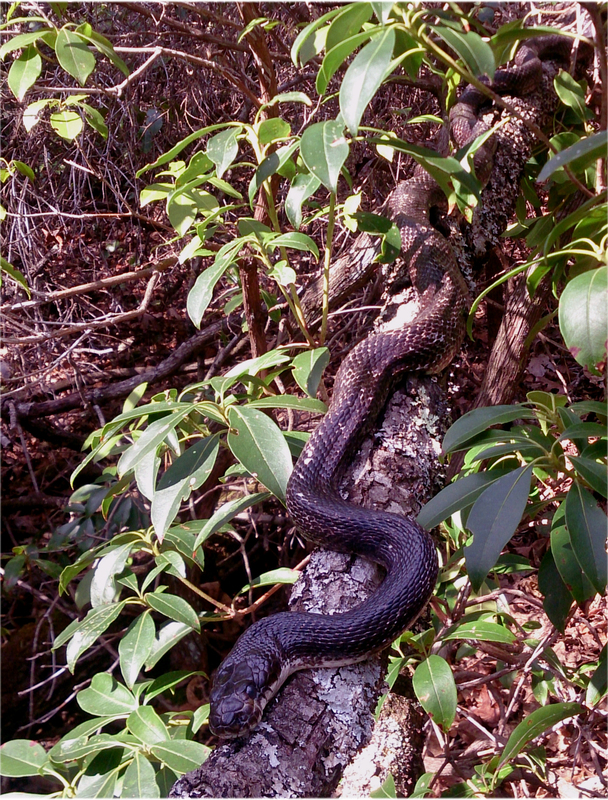 Earthshine Nature Programs is a separate entity from Earthshine Discovery Center and Trails Carolina/Academy however, we work directly with these institutions of environmental education to promote the conservation and respect of our native wildlife and wild places. It is our mission to educate you about these beautiful but greatly misunderstood animals and hopefully, to impart to you their beauty, uniqueness and intrinsic value to a healthy Earth, healthy wildlife and healthy humans.